She wakes up in the hospital with amnesia, petrified because she doesn’t know anybody or anything about herself. He’s crushed because the woman he loves doesn’t even recognize him. After a critical car accident, Cooking Network host and bestselling cookbook author Clarissa Boneli doesn’t remember who she is or what she’s done with her life. Worse, she doesn’t recognize the man she loves. But piece by piece, she begins to see there were two Clares: one who loved her friends and made time for them. And one who became aloof and sophisticated and didn’t seem to care who she hurt. Children’s books author and illustrator Brady Langston is heartbroken when Clare doesn’t remember him. They’ve shared their personal and professional lives for years, and he can’t believe she could forget all they meant to each other. At least not the old Clare. After all, hadn’t the new Clare left him in the dust? Apparently, Jonathan Harris, the show’s owner, is the man in Clare’s life. He’s classy, interesting and seems devoted to her. He tells her they were planning to move in together and marry. Then why is it that Clare is drawn to Brady and not the man they say she was going to wed? Irrevocable mistakes and dark secrets are revealed to the reader as Clare remembers them. Along with those, she has fleeting glimpses of tender moments and sensual intimacies that hint at the man Clare truly loves. 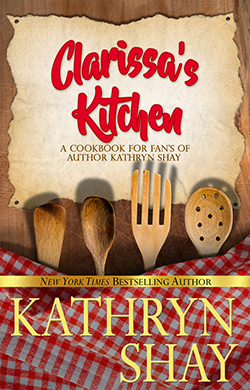 Food lovers everywhere will relish in the world of glamorous cooking shows and be privy to the recipes Clare creates and the stories that go with them. 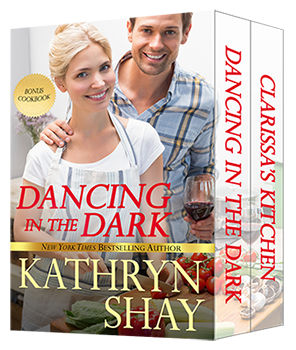 As a bonus feature, CLARISSA’S KITCHEN is included with this package! It’s a cookbook containing the recipes in the novel, many from Mary Grace Boneli, the author’s grandmother, from the author’s extended family, the Ruoccos, and some from her nuclear family’s kitchen. If you love Italian food, there are plenty of dishes for you! Go out and grab your copy of this second chance, reunion story, peppered with society’s contemporary obsession with cooking shows and online recipes.